Based on a table-top roleplaying session involving Gen Urobuchi (Psycho-Pass), Ryohgo Narita (Baccano!, Durarara!! 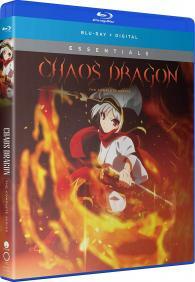 ), Kinoko Nasu (Kara no Ky?kai) and more, Chaos Dragon tells the story of two countries locked in a brutal war. When the constant fighting causes a guardian god known as Red Dragon to spiral out of control, a small group of heroes must rise-up to bring peace back to their world.